Browsing Sear's product catalog, I often saw 'top' reviews with poor grammar, low feasibility, and literally "second rate" content to help me make purchasing decisions. Many reviews started with "I got X for a HUGE discount on Black Friday. Totally awesome for the price!". To future customer that are looking to purchase, Sears should not make them feel like they are paying more than the next guy for the same product. This practice discourages sales. 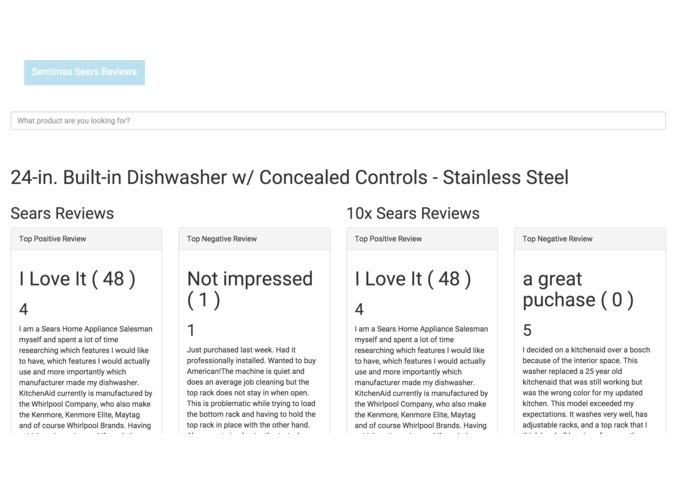 Often I will see other reviews further down the list that reflects a more positive sentiment than the top result, I found this helped me make a better decision when purchasing an item from Sears. Sentimus uses propriety natural language processing and machine learning to optimize find the best reviews to feature to users. Creating an algorithm that was equal or better than the existing voting system. Natural Language processing algorithm backing that leverages existing Sear's Customer support API. Using Apigee's platform I was able to enhance Sear's existing system providing an better review api. NodeJS is awesome! 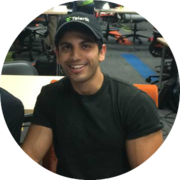 Apigee, while having its quirks, is a very powerful platform for hosting NodeJs applications. Since this API integrates seemlessly with Sear's existing API, we would like to see Sears run an AB testing phase to compare Sentimus's output with their existing algorithm. Integration should be very easy, since they both return the same information, just re-ordered.